Tonight’s the night! The Street Stops Here airs tonight on PBS at 10pm EST. Don’t miss this powerful story about an inner-city high school basketball team, and the coach and school leaders who make it possible. Can’t wait ’til this weekend’s March Madness finals for a basketball fix? Don’t miss The Street Stops Here, a new documentary about high school basketball champions from St. Anthony High School in Jersey City. Their coach, Bob Hurley, Sr., is a legend in high school basketball, with more than 900 victories in his 35 years at St. Anthony’s. Perhaps even more impressive, all but two of the players he’s coached throughout his career have gone on to college – many with athletic and academic scholarships. What a staggering accomplishment! The documentary will appear on many PBS stations, including NYC’s Channel 13, this Wednesday, March 31 at 10pm. Check your local listings! We are excited to announce the release of the latest Required Reading, Volume VII, Issue I. This issue takes you around New York state and New York City. 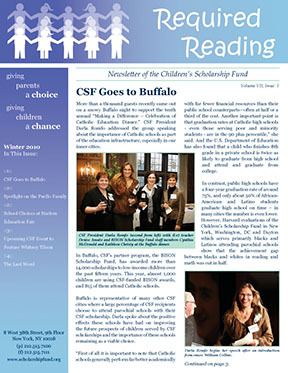 CSF President, Darla Romfo, is the keynote speaker at Buffalo’s tenth annual “Making a Difference – Celebration of Catholic Education Dinner.” Special shout out to CSF’s partner program in Buffalo, the BISON Scholarship Fund, which has awarded more than 14,000 scholarships to low-income children over the past 15 years. Follow thousands of parents trekking in the snow to the third annual Harlem Education Fair to get more information about schooling options – private, charter, public – for their children. CSF announces the next conversation at the English-Speaking Union, featuring education reformer Whitney Tilson. Mark your calendars – Tuesday, April 20th! Mr. Tilson is a hedge fund manager, education reformer, philanthropist, finance guru, and author! Wow – you can’t miss this! Enjoy the trip! And if you would like a hard copy sent to you in the mail, please contact azamudio@scholarshipfund.org.